Photo: Remember your stay in JB. Johor Bahru, or JB, lies just across the Johor Strait from Singapore and has long been regarded as that bright and shiny metropolis’ ugly step sister. But while JB has long had a reputation as a hotbed of sleaze, crime and pirated DVDs, change is afoot. Much of the questionable activity has relocated these days, and this emerging Cinderella is in the wings getting dolled up in her ball gown, well on the way to saving her somewhat sullied name. As well as the ever increasing high-rise developments, local NGO Think City has been working with the local government and communities to transform JB into a more liveable city, as is evident in JB’s revamped heritage district. Other than day-trippers from Singapore drawn by cheap shopping and excellent food, or folks heading to Malaysia’s Legoland, most travellers hang around just long enough to hop on the next bus, train or boat out. But the hipster-ised heritage district, a handful of worthwhile sights including mosques, temples and museums, plus great eats, are good reasons to linger longer. If you’re travelling towards Singapore, you have even more cause to consider spending the night in JB, where you’ll get more bang for your hotel buck. JB is the capital of Malaysia’s Johor State, and the southernmost city on the Eurasian continent, about two-and-a-half hours by road from Melaka, and four-and-a-half hours from Kuala Lumpur. It’s linked to Singapore by a busy (often jam-packed) causeway just over a kilometre in length, transporting cars, buses, trains, pedestrians and much of Singapore’s fresh water (until the deal expires in 2061). JB’s downtown area near the CIQ complex (Customs, Immigration and Quarantine) and JB Sentral, the main bus and rail connection, conveniently offers the bulk of sights along with a handful of decent hotels (mostly midrange and up), and eateries that lure Singaporeans on their own. The Sultanate of Johor was established in the early 1500s by Sultan Alauddin Riayat Shah, the son of the former Sultan of Melaka, Mahmud Shah, who had fled the invading Portuguese. Three hundred years of battles and expansion led to Johor’s peak of power, which included ruling over parts of Sumatra, the Riau Islands and Pahang State. A visit by Sir Stamford Raffles to a Johor village in 1819 ushered in the age of British influence. Raffles was scouting locations for a new British East India Company trading post and struck a deal with the village Temenggung (Chief of Defence): In exchange for exclusive trading rights on a small island now known as Singapore, the British would offer Johor their protection and an annual payment. By 1855, with the security of Johor assured, an administrative headquarters was established in Tanjung Puteri along the Johor River (the site of contemporary JB). Johor Bahru’s road to success is generally attributed to a later Temenggung, Abu Bakar, who not only gave the town its modern-day name, but also appointed himself as Johor’s Maharaja and then Sultan of Johor, largely due to the fact that the rest of the world didn’t know the meaning of the Malay title “Temenggung”. Considered the father of modern Johor, he initiated policies that stimulated development, notably aiding Chinese entrepreneurs to develop Johor’s agricultural economy with pepper, gambir and rubber plantations. A tenacious Anglophile, he followed the British system in establishing Johor’s infrastructure, administrative system, military and civil service. Construction during his reign resulted in several of today’s notable buildings, including the Abu Bakar State Mosque and Istana Besar, many of which were built by Wong Ah Fook, a Chinese contractor who gives his name to one of Johor Bahru’s major streets and a whole section of the city. He granted parcels of land to JB’s other immigrant communities where today we can find Hindu, Sikh and Chinese temples as well as mosques and churches. During World War II, Japanese forces occupied Johor Bahru and prepared for their invasion of Singapore. After the war the British returned but were unable to regain control. Johor joined the Malayan Union in 1946 and achieved full independence as a part of Malaysia in 1957. You can spend a day exploring JB’s history by following our heritage walking itinerary. If time is short, grab a taxi to one of the top sights: Victorian-style Sultan Abu Bakar Mosque or sparkling Arulmigu Sri Raja Kaliamman Glass Temple. You could easily fill hours wandering among the traditional traders, hipster cafes and boutiques in the heritage district around Jalan Tan Hiok Nee and Jalan Dhoby. Here look out for quirky Evangelina Dollmaker with weirdly creepy handmade dolls, or see what’s on show at Art 52, a small commercial gallery. Pick up some funky threads at Bev C, then queue at one of JB’s famous food stalls. In the evening JB Bazaar (also known as Pasar Karat) gets into full swing, with street stalls selling everything from karaoke microphones to clothing (mostly aimed at local tourists). Hit the malls, or if you have kids in tow (or are a kid at heart), Angry Birds Activity Park is right in the centre of town in Komtar Mall. JB’s biggest attraction, Legoland, is only a half-hour drive from the city centre and offers rides, a water park and a mini-tour of Asia’s top sights made of plastic bricks. We were reluctantly dragged along by kids and were surprised at how much fun we had. For other franchised merriment, Sanrio Hello Kitty Town and Thomas Town (yep, the train) are both not far from Legoland at Puteri Harbour. Johor State has more to offer than Johor Bahru, particularly for nature lovers. You can dive off the coral-fringed islands of the Seribut Archipelago, conquer Gunung Ledang, or go trekking in Endau-Rompin National Park, home to elusive rhinos and tigers. Bisecting Johor Bahru is Jalan Tun Abdul Razak, a heavily trafficked road that eventually leads to the causeway. One street west, Jalan Wong Ah Fook, is a major commercial thoroughfare where you’ll find glitzy shopping malls including Johor Bahru City Square and Komtar. Most hotels, restaurants and banks can be found here or along nearby side streets, with a growing number of hotels and condos spreading into the development east of Jalan Tun Abdul Razak. A clustered grid of streets make up the centre of town. Jalan Ibrahim stretches along the waterfront west of the causeway leading to JB’s royal quarter, where you’ll find the Sultan Abu Bakar Mosque and Istana Besar. Tourism Malaysia have a booth at JB Sentral while Johor Tourist Information Centre is tucked away on the fifth floor of 2 Jalan Ayer Molek, Johor Bahru (a large yellow and white building near TGIF). For medical treatment, Hospital Sulatnah Aminah is JB’s largest public hospital, located on the western side of the city centre. KPJ Johor Specialist Hospital is a large private hospital five kilometres northwest of the city. The central police station is located at the southern end of Jalan Meldrum (T: (0722) 32222). The post office is on Jalan Dato Onn. Trains to Singapore and Kuala Lumpur, and buses to Singapore, leave from JB Sentral, found smack bang in the middle of the city. For many other destinations, Larkin Sentral, the long-distance bus terminal, is five kilometres north of the city centre. Senai International Airport is 30 kilometres north of town. Ferries to Batam and Bintan Islands in Indonesia leave from Berjaya Waterfront 2.5 kilometres east of the city centre. Angry Birds Activity Park: Level 3, KOMTAR Johor Bahru; T: (0722) 10260, (0730) 05090; www.angrybirdsactivitypark.my. Art 52 Gallery: 52 Jalan Tan Hiok Nee, Johor Bahru; T: (0167) 882 420, (0187) 772 420; open Tues–Sun 10:00–17:00. Bev C: 54 Jalan Tan Hiok Nee, Johor Bahru; T: (0167) 253 530, (0722) 13530; www.bevcclothingbrand.com; open Sun, Tues–Thurs 11:00–20:00, Fri–Sat 11:00–22:00. Evangelina Dollmaker: 22 Jalan Tan Hiok Nee, Johor Bahru; www.evangelione.com; open Sat–Sun only 12:00–17:00. Hospital Sulatnah Aminah: Jalan Abu Bakar, Johor Bahru; T: (0722) 31666; hsajb.moh.gov.my. Legoland Malaysia: Iskandar Puteri, Johor; T: (0759) 78888; www.legoland.com.my; open Mon–Thurs 10:00–18:00, Fri–Sun and school holidays 10:00–19:00. Sanrio Hello Kitty Town and Thomas Town: Puteri Harbour; T: (0322) 039 668; www.puteriharbour.com; open daily 10:00–18:00.  Please sign up as a Travelfish member to download the Johor Bahru guide PDF (7.8 MB, 37 pages). Membership costs just A$35 per year (less than A$1 per week) and gives you access to over 250 PDF guides. 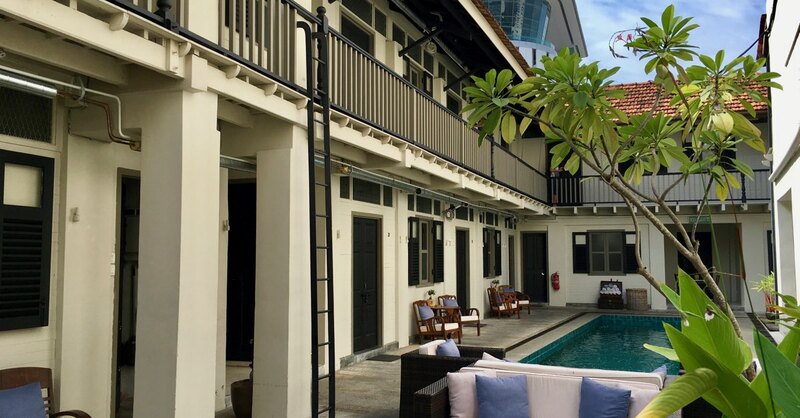 Browse our independent reviews of places to stay in and around Johor Bahru. Read up on where to eat on Johor Bahru. Check out our listings of things to do in and around Johor Bahru. Read up on how to get to Johor Bahru. Planning on riding a scooter in Johor Bahru? Please read this. Use the above map to find specific destinations in and around Johor Bahru which are listed on Travelfish. Bed icons indicate a guesthouse, hostel or hotel, the knife and fork is an eatery or bar and the four-way circular thingy marks sights, attractions and other points of interest. Click on any icon for a short pop-up and a direct link to the page for that spot. If you are in the area, use the teardrop icon near the top left to show your position on the map (you'll need to allow position sharing for this last feature to work).